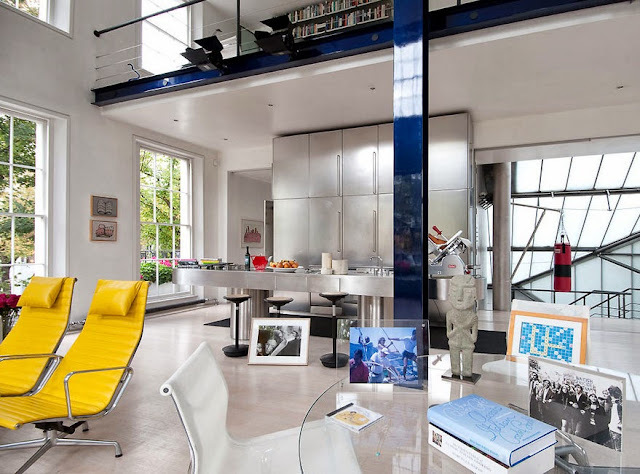 Ruth & Richard Rogers’ London home in Chelsea, near Sloane Square, is a a light-flooded loft, designed back in 1983, when two typical Victorian Chelsea townhouses were joined together. Lord Rogers is known for hi-tech contemporary creations such as the Centre Pompidou in Paris, Heathrow Airport’s Terminal 5, the Lloyds building, and the Millennium Dome in London. 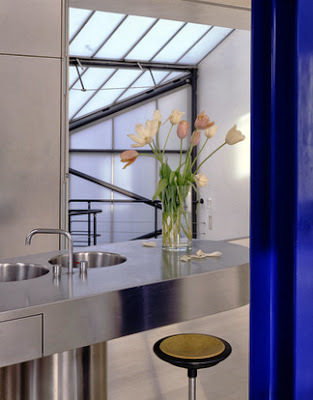 Rogers house is a tribute in simplicity and looks timeless, uncluttered, carefully organized and totally contemporary. Over the past years not much has changed, except from the art. Internal spaces include the “piazza” (term used by the owners for their main living space), the spacious open kitchen and an impressive staircase connecting two levels above, for study and sleep. 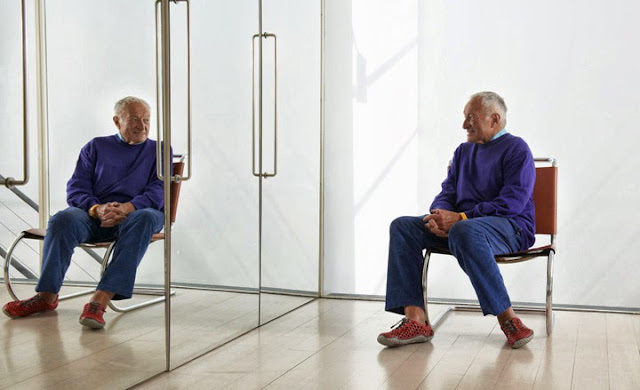 For those in London, exhibition Richard Rogers RA: Inside Out still runs at Royal Academy of Arts In Burlington Gardens until 13th October 2013. 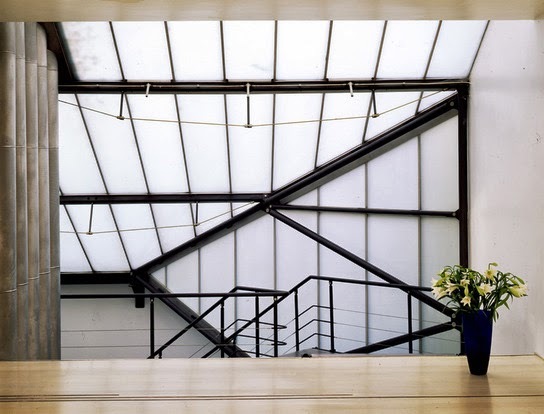 Ruth Rogers jokes that her husband, whose accomplishments include Centre Pompidou, Lloyds of London and The Millennium Dome, took a house and turned it into a barn. Yet extraordinarily, the exterior of the building is an archetypal Georgian terrace; a resplendent facade in London brick with uniform windows and smart stucco. 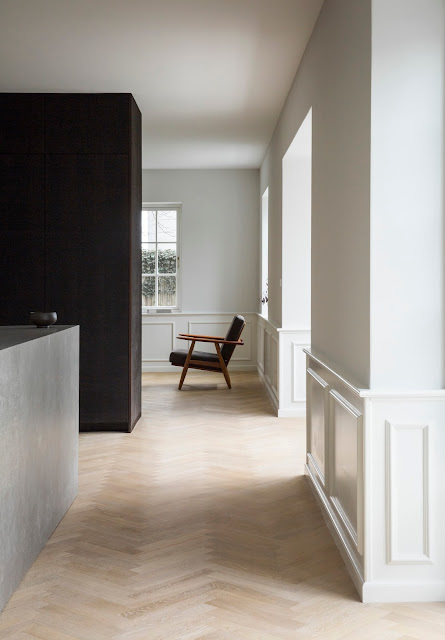 From the street there is no hint of the vertiginous staircase that zigzags through the air of the dramatic living space inside. “A room is the beginning of a city,” says Rogers and there are plenty of nods towards his architectural preoccupations. An industrial palette of natural light and acid-bright color is everywhere. Even the window-box geraniums are a signature pink. 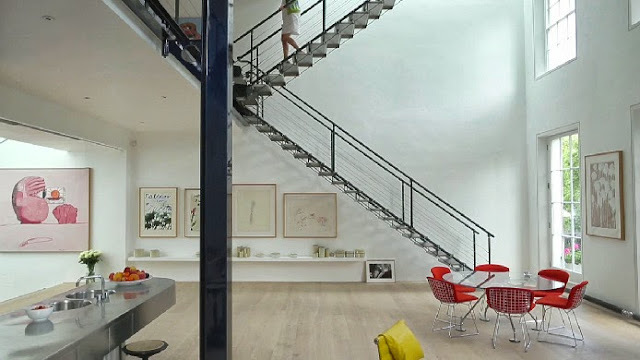 A column of Mao Zedong portraits courtesy of Andy Warhol, works by Cy Twombly and a fine collection of Philip Gustons are displayed alongside Mexican craft art and clusters of elegant ceramic vessels made by Richard’s mother. That the Rogers refer to the living space as a “piazza” is significant; the communal spirit of Italy, and in particular Florence where Richard was born, is an enduring influence on them both.